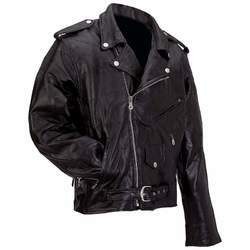 The Diamond Plate Rock Design Genuine Buffalo Leather Motorcycle Jacket is road ready. Epaulets on the shoulders and buttons on the collar and lapel snap down. Convenient side laces for an adjustable fit. Zippered back vents keep you cool and zippered wrist panels can cover gloves. Theres even a zip out liner for adjusting temperature, so you know this jacket is road-ready for all occasions. Silver-tone hardware with matte buttons.